New old stock have been in long term storage. These are the Real Old School Heavy Duty Sleeping Bags. These are not light weight, but they are very warm! 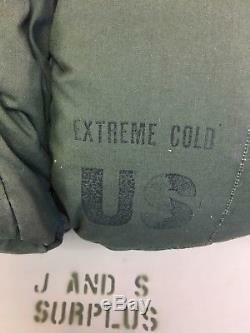 US MILITARY ISSUE EXTREME COLD WEATHER SLEEPING BAG IN OD GREEN. These sleeping bags are made of water-repellent poplin cotton outer shell with 80% down 20% polyester filling. They feature a 64 in long zipper, offset stitching at the seams and a 3 in storm flap with snaps over the zipper. Mummy style bags with a draw cord hood to keep in heat. These bags are 84 inches long, 30 in wide at the top and 14 in at the bottom and weigh 8lbs. They were issued from the 1970's into the early 2000's. 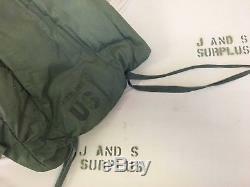 Our names are J im and S eth, we are not part timers, we are full time military surplus dealers. E are passionate about military equipment, if its USGI Camo, tactical, OD Green or in any way militaria, we automatically want one. When we work we day dream about: Hunting, fishing, camping, hiking, boating, canoeing, shooting and all the other outdoor activities / pastimes we love. Outdoor enthusiast like us realize the rugged cost to value benefits of Government Issue (GI) military gear and apparel. If you arent happy we want to make it right. Due to the nature of surplus gear we miss things, when we do simply let us know so we can make it right. We started in a garage and within 6 months we occupied a 6500 sq. We truly understand that our success is based on quality gear and unmatched customer service. If you make an offer or have a question or concern, our goal is to measure our response time in minutes, not hours or days. When we find a good deal, we pass it on. Knowing quality pays in the end, we are confident. J & S Grading system. If we miss something please let us know. Items are described in more detail in the listings. = New item in manufactures packaging (unless removed for photos). = Excellent, functional gear, bright colors, all parts intact. = Good, light use with NO holes or rips. = Good, may have: signs of use, abrasions, holes, fading, some light dirt or dust, small snags, and light scratches. (holes no larger than a pencil). = Average / Moderate, expect 1 or more of the following: Dime size or smaller holes, wear, abrasions, dust, dirt, discoloration, scratches, staining, fading. = Worn out, no longer useful as intended, large holes, useful only for parts. = indicates some items have been professionally repaired (Example: a condition of B/R grading would indicate this B rated item has been repaired). In our photos we attempt to represent the average condition of our inventory, however most pictures are for display purposes and not of the actual item. If you are not comfortable ordering without a picture, simply message us, we are happy to provide actual pictures. Surplus gear has been used by soldiers in the field, it will show wear, and most times it is no longer perfect or new. Due to the harsh combat environments gear will show: wear, dirt, dust, staining, discoloration etc. Rather than downgrading some field gear we send it out for repairs, this is done at a local upholstery shop. All repairs are professionally completed to last. We have a deep appreciation for those who have proudly worn the uniform. If you were enlisted or have served in any branch of the service: United States Marine Corps USMC, Army, Navy, Coast Guard, National Guard, or the Air Force USAF. We would like to take offer a sincere thank you personally for your service and sacrifice to this great country. To all Fire, EMS and Law Enforcement, Thank you for your service and sacrifice. From J & S Surplus Thank You! 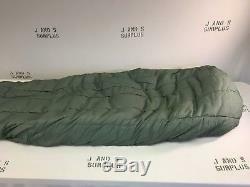 The item "Us Military Extreme Cold Sleeping Bag NSN 8465-01-033-8057 Used Down Filled" is in sale since Monday, June 4, 2018. This item is in the category "Sporting Goods\Outdoor Sports\Camping & Hiking\Outdoor Sleeping Gear\Sleeping Bags". The seller is "jandssurplus" and is located in Martinsville, Indiana. This item can be shipped to United States.